(Photo: REUTERS / Stringer)A Christian woman carries a cross during a demonstration against militants of the Islamic State, formerly known as the Islamic State in Iraq and the Levant (ISIL), in Arbil, north of Baghdad July 24, 2014. 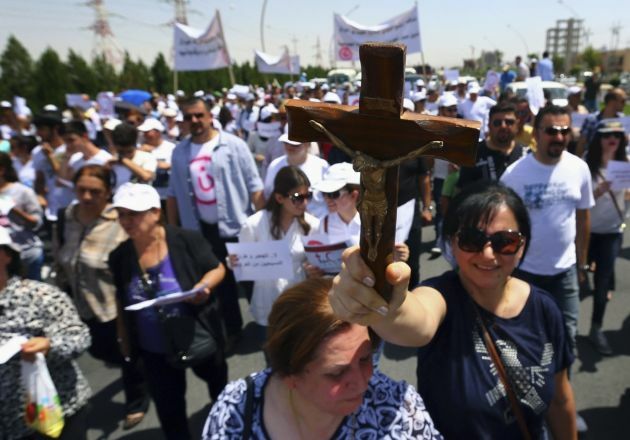 Hundreds of Iraqi Christians marched to the United Nations office in Arbil city on Thursday calling for help for families who fled in the face of threats by Islamic State militants. Tens of thousands of residents have escaped to Kurdistan after the Islamic State (formerly ISIL) seized Iraq's largest Christian town, Qaraqosh this week. Residents said that the jihadists moved in after pushing back Kurdish Peshmerga troops spread thinly across several fronts in Iraq. "I now know that the towns of Qaraqosh, Tal Kayf, Bartella and Karamlesh have been emptied of their original population and are now under the control of the militants," Joseph Thomas, the Chaldean Archbishop of Kirkuk and Sulaimaniyah, told Agence France-Presse, the Daily Star reported. Qaraqosh is an entirely Christian town that lies between Mosul, the jihadists' main hub in Iraq, and Arbil, the Kurdish region's capital. It has a population of around 50,000. "It's a catastrophe, a tragic situation. We call on the UN Security Council to immediately intervene. Tens of thousands of terrified people are being displaced as we speak, it cannot be described," the archbishop said. Boutros Sargon, a resident who fled Tal Kayf confirmed that his town is now in the hands of the Islamic State. "They faced no resistance and rolled in just after midnight," he said. Tal Kayf is home to a significant Christian community as well as members of the Shabak Shia minority. "I heard some gunshots last night and when I looked outside, I saw a military convoy from the Islamic State. They were shouting 'Allahu Akbar' [God is greatest]," he said. Chaldean Patriarch Louis Sako, who heads Iraq's largest Christian denomination, said the overnight offensive had displaced 100,000 Christians. Sako launched an SOS through Fraternité en Irak to the international community. "Among the thousands of people on the road, the elderly, the pregnant women or children are particularly at risk: it will make about 55 degrees on the road today," read its messaget. According to Ireland's RTE News, French Foreign Minister Laurent Fabius has called for an urgent meeting of the UN Security Council following the ISIS attack. "Given the seriousness of the situation - the first victims of which are civilians and religious minorities - France is requesting an urgent meeting of the Security Council so the international community can mobilize to counter the terrorist threat in Iraq and support and protect the population at risk," Fabius said in a statement. Meanwhile, the Foreign Minister of Iraqi Kurdistan told CNN that the United States has a "moral responsibility" to intervene. "I believe the United States has a moral responsibility to support us, because this is a fight against terrorism, and we have proven to be pro-democracy, pro-West, and pro-secularism," he said.